Our sense of touch comprises of five mechanisms registering pain, heat, cold and pressure, as well as physical contact with object at the most basic level. The innermost working of the complex network of nerves that communicates signal to the brain from all part of the body’s surface and the way in which we then interpret them as conscious feelings, are not within our comprehension any more than a total understanding of the other sense organs. Rub your nose with the pointing finger and the middle finger of your hand and you will feel the tip of your nose. The information imparted to the touch receptors on the inner side of the pointing finger and the adjoining side of the middle finger which is transmitted to the brain, is pieced together to form a mental image corresponding to the nose which we know. Now cross those same two fingers and rub your nose again. This time you will feel two noses, the result of familiar stimuli traveling to the brain by two paths. Not used to merging in our mind the impressions made on the opposite sides of the two fingers, namely their outer edges, we find it difficult to register a single nose. 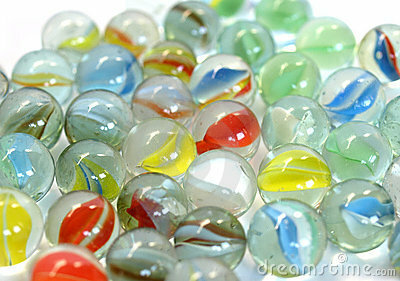 Effect: One marble rolled with crossed index and middle finger seems to be two marbles. Props: Two big marble balls. Method: Try rolling a large marble between your crossed fingertips on a table and you will feel two marbles. You will obtain the best results if you roll the sphere in such a way that it touches first one finger and then the other in turn. It is also necessary that you close your eyes. You can try this on a volunteer by showing him two marbles and asking him to close his eyes. You then guide his crossed finger to rest on them while actually keeping only one marble in his palm and keep the other in your pocket. Ask him how many he can feel. He will say “two”. Then ask him to open his eyes and two his surprise he sees only one marble. This is because two separate nerves on the outer side of the index finger and the middle finger send the touch impression to the brain at the same time. Thus the brain registers the feeling of two marbles. Method: The fake spirit mediums of the early years of this century often included amongst their unscrupulous tricks the following experiment in “dematerialization”. It relies solely upon our susceptibility in certain circumstances to continue feeling something long after it has been removed from our body. Call a volunteer, request him to keep his eyes closed or have him blind-folded in such a way that he can see nothing, and ask him to sit on the chair in front of you. Take the disc and exerting some pressure, place it on his head, removing it again immediately without telling him so. He will now continue to feel the disc on his skull for as long as you wish him to believe it is there. The mediums themselves would then hide the prop under their coats or a cushion on a chair close by and not draw attention to its disappearance until several minutes later. Then they would ask the victim to reach up for it with his hand. Method: The initiation ceremony of the Shakers, an American religious sect, makes use of the same phenomenon. One is asked to lean back on his chair, whereupon a slightly moistened coin is pressed firmly on the centre of his forehead where he is unable to see it by looking upwards. As in the earlier test, it is removed instantly without his knowledge. He is now told to shake the coin off his forehead without moving from his chair or touching it with his hands. His frustrated efforts to do so provide a travesty of the “Shaking” with which the original Shakers are said to have trembled in religious ecstasy. From the above experiments, and also hundreds of other experiments, we can prove that our senses are susceptible to deceptive perception. Therefore the subjective experiences of devotees cannot be accepted as a proof of the miracles of godmen or avatars. The minds of the devotees are already conditioned through the mystique of the godmen. While at the ashrams of the godmen, their senses are engrossed fully in the rituals held there. The scent of the incense and flowers occupy the olfactory function, their eyes take in the beautiful men and women assembled, while devotional music sung melodiously, or the constant monotonous ringing of a bell entangles the sense of hearing and the sense of touch is engaged, as in the mind, in meeting people and talking to them. The sense of taste is stimulated by the sweet and savory dishes offered as Prasad. To this confusion and clamor of the senses miracles happen when the mind is preoccupied and the ability to perceive reality is at its lowest. In such circumstances their evidence proves to be highly biased and distorted, warped with preconceived notion and the godman’s charisma. It is essential therefore that godmen and avatars undergo investigations of their claims of supernatural powers under fraud-proof conditions using the methods of science. Only this can prove beyond doubt that they are deceptions.